While there has been a lot of conversations about what will and will not be launched at Apple's "Let's Talk iPhone Event" since there is no live stream for viewers to watch -- we have collected a series of photos live blogs around the web. UPDATE: Here is a link to the video of the "Let's Talk iPhone" event at Apple's Infinite Loop campus. ARS Technica photo of Tim Cook giving an overview of Apple's marketshare of the mobile phone market, stunningly only 5%. But, the iPhone is the number one smartphone in the world [ see their coverage here ]. Mac is approaching 60M users worldwide and is outgrowing PC 4-to-1. Apple has sold more than 300M iPods around the world. Market share has been above 70% for a long time. Apple has officially introduced the iPhone 4S. The phone will be identical to the iPhone 4, except that it will run on the A5 chip -- the same one the iPad 2 runs on. The iPhone 4S will also have up to 7x faster graphics which will enhance the gaming experience on the iPhone. 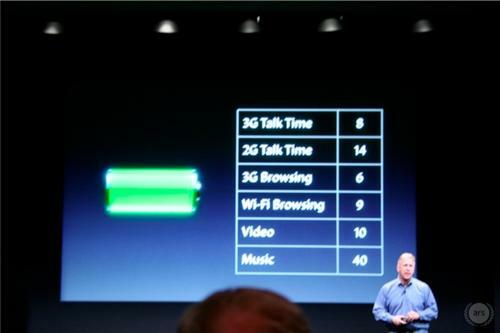 Phil Shiller says Apple has also beefed up the iPhone's battery power allowing up to eight hours of 3G talk time, 14 hours of 2G talk time, six hours of 3G browsing, acorrding to the ARS Technica live blog. The iPhone S' camera features an 8MP sensor, giving it more than 60% more pixels and was designed to compete with point and shoot cameras. 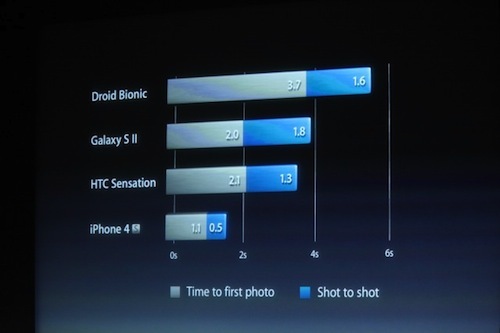 It also collects more than 73% more light than the current iPhone 4 and a 33% faster capture rate. "We left one thing out. It’s a feature all about our voice," Ryan Block of GDGT writes on their live blog [ see GDGT coverage here ]. 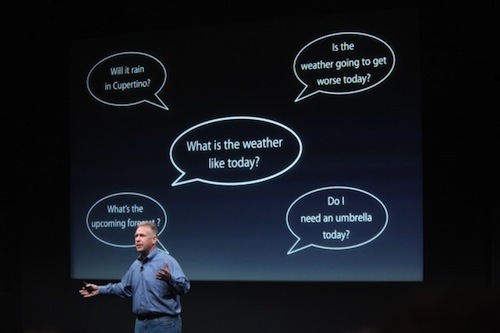 Shiller announces a new feature for the iPhone 4S, Siri, an intelligent assistant that helps you get things done through voice commands. Siri can be used to call people, create reminders like setting an alarm, compose emails, get traffic and directions, find out the weather and a variety of other tasks with built in support for English, French and German. More languages will be added over time [ see more coverage at engadget here ]. Price for the new iPhone 4S: 16GB: $199, 32GB for $299, 64GB for $399 [ watch the engadget live blog here ]. The iPhone 4S will be available on AT&T, Verizon and Sprint. The "Let's Talk iPhone" event ended around 11:35 am PDT.